Chances are you’ve spent a lot of money on the tattoos that you have (a cheap tattoo isn’t good and a good tattoo isn’t cheap after all) but there may be times where you want to cover them up, for example a wedding or a job interview. This may seem impossible, especially if the tattoo has a lot of black in it, however there is a handy little product that is great for camouflaging a number of things, including tattoos! 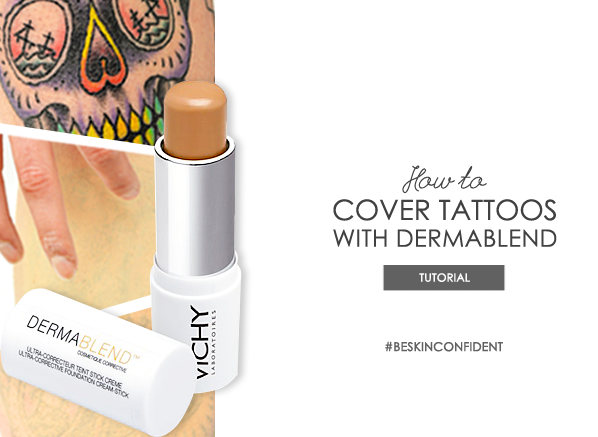 The Vichy Dermablend Corrective Cream Stick was formulated for severe skin flaws including; Irregular pigmentation, blemishes, vitiligo and scarring. It’s also great for covering up any tattoos that you don’t want to be seen. It boasts 40% pigment control, 12 hour hold, SPF 30 and a resistance to sweat, perspiration, bathing and rubbing, which is great for daily life. As someone who is quite heavily tattooed I decided to see how effective this would be at covering up one of my many colourful and vibrant tattoos, I wasn’t disappointed. 1. 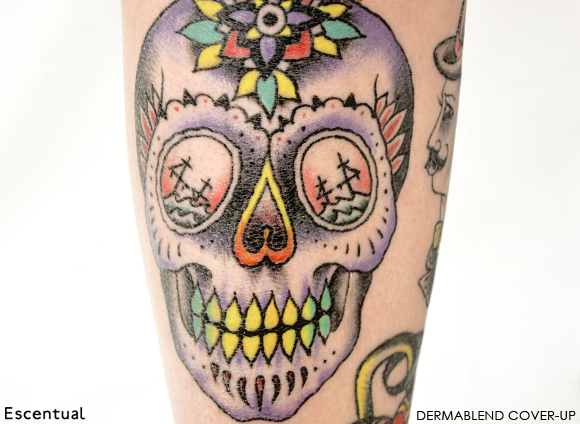 We are classing my lovely Sugar Skull tattoo as a ‘severe flaw’ so I followed the relevant instructions and applied the Dermablend Foundation Stick directly onto my leg, I then used my fingertips to start to blend the formula into the skin to ensure even coverage. I’m using the palest shade, which is 11 Porcelain and it’s a really good match for my skintone. 2. 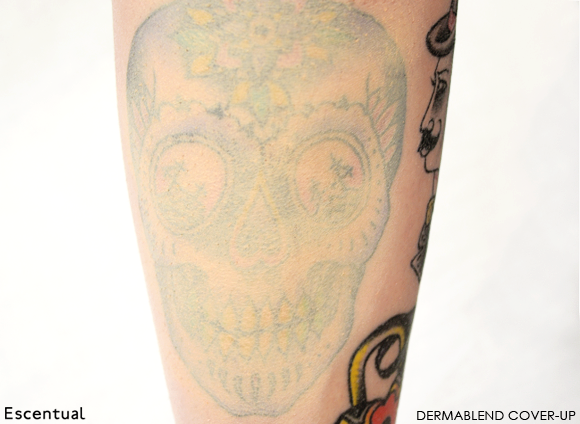 As you can see the layer has gone on to my skin and hasn’t made the tattoo disappear instantly, however the brightness is significantly reduced and the colours are muted, which is very impressive for one layer. 3. Time for a second layer and we can see now that there is no colour at all apart from the black outline and detailing in the face, if you were to glance at my leg or to see it from a distance it probably wouldn’t be visible. 4. The final layer eliminates most of the detailing and the outline is only just visible. 5. 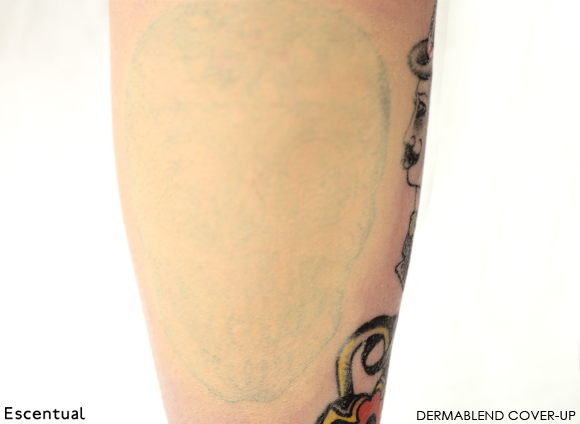 Three layers is as much coverage as I think my tattoo needs so I used the Vichy Dermablend Setting Powder to prolong the wearability of the Foundation Stick and also help to prevent smudging. Looking at the photos in close detail you can see that the tattoo is still slightly visible but what struck me was how well it did cover it. The vast majority is covered and the shade blends well with my natural skin tone (pale if you hadn’t noticed!). This product isn’t a miracle worker; it isn’t going to clone your existing skin so you look tattoo free. When looking at it closely it does have a make-up look, but it does an excellent job of drawing the eye away from the area that you don’t want people looking at. If the eye isn’t looking for a flaw, chances are it probably won’t find it. All in all this is a handy little product, it isn’t messy, it’s simple to use and most importantly it’s effective. Attention is drawn away from the area and it doesn’t budge (as I discovered when I tried to get it off after taking the photos! ), so if you’re worried about it smudging and staining your clothes, don’t be. I saw a makeup artist use this product on a You Tube clip. Thought I'd try it but was a little sceptical that it may not be as good when applied by myself but I was really pleased with the results. 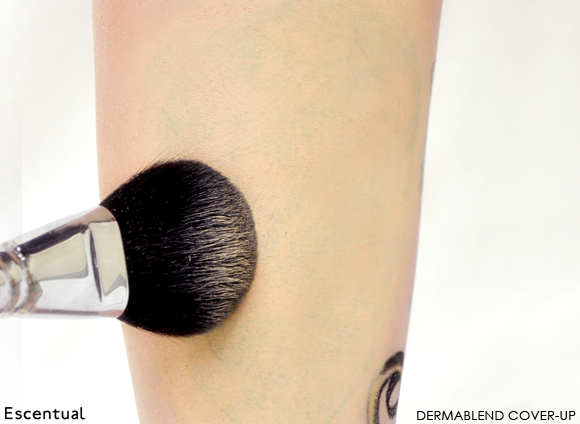 Bought with the corrective stick and foundation. Have tried other corrective products which I knew I was wearing because I felt caked in makeup but no such problem with these products and they lasted all day. Would highly recommend this product. This entry was posted on Wednesday, January 30th, 2013 at 9:01 am and is filed under Make-up, Skincare, Tried & Tested. You can follow any responses to this entry through the RSS 2.0 feed. You can skip to the end and leave a response. Pinging is currently not allowed. great article. clean and precise!